The latest edition to my creature creations! 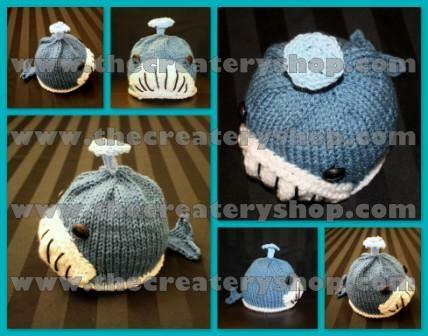 This whale of a hat is just so cute! I was thinking for awhile about making a whale hat, then I saw in a magazine that whales are going to be the hot new trend this year for kids and baby stuff! Go figure the gentle giant would make it's way into pop culturalism. Knitting Pattern in PDF Format. Step-By-Step Instructions with color photos to help you along the way. Size: (0-9months, 9months to 2yrs, 2yrs+). Please note baby head sizes vary so much! Gauge is not important for this hat. Don’t feel like knitting? I can make it for you! If you would like to receive the item made and shipped to you, just contact me for more information.